Blog Quick Quotes: Upcycling with Donna! Hi everyone, Donna here to show you how to recycle and reuse in scrapbooking. If you're like me, I get a ton of greeting cards, and it seems more and more they have embellishments on. I guess my family knows how much I love scrapbooking, so it seems to me they deliberately give me a card with some kind of embellishment on that I can repurpose to my layouts. 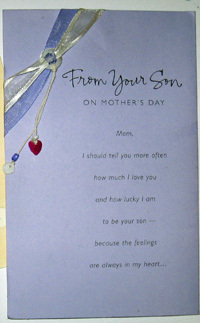 Here is an example of a card I received recently. 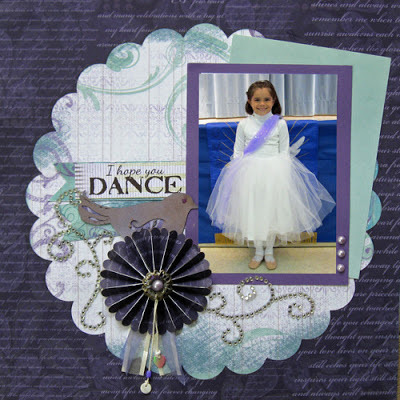 Instead of just tossing the card out, I took off the embellishment and ribbon and repurposed it on my layout below. Very pretty LO and transformation of product. Great idea and fabulous dance LO. The purple colors are adorable. What a little princess!! I love that you used the embellishment on your layout!